I am alive! I have survived my first two weeks at uni and am getting into the whole meal planning spreadsheet lifestyle B) #beingorganisediscool. I mean yes, half my room is a devoted pantry and I have a window display of succulents, a butternut squash, ginger, tomatoes and onions, so of course I’m happy. I’ve also been cooking completely meat-free so far and I am looooving it!! My Food Science & Nutrition lectures have only just started but so far so good – I’m sure I’ll be writing more about what I’m learning as time goes on. But for now, onto the next no-added-sugar recipe! One of the most interesting ways I found for sweetening things up without sugar was using sweet potato. Usually when making desserts, I’d reach for an overripe banana as a natural sweetness booster. It works brilliantly and can help with the textural problems (namely, dryness) that come about from removing sugar from baked goods too. However, bananas have a damn strong flavour and everything ends up tasting pretty much the same. One day I was thinking about how sometimes people use pumpkin purée as they would mashed bananas in quickbreads – again the pumpkin provides moisture but, unless you’re using something like butternut squash puree, it’s not sweet at all. I remembered having a sweet potato & pecan bread at El Rey in New York (it was goooood.) so that led me to thinking about using sweet potato puree in desserts instead of pumpkin or banana. Many recipes use overripe bananas to sweeten smoothies/’mylkshakes’ and provide a thick creamy texture, so I wondered if this would apply to the sweet potato purée due to the similarity in results from baking. They’re both high in sugar with a similar texture once blended, plus sweet potato purée is very creamy on its own. So I set out to make a sweet potato sweetened milkshake. I didn’t add very much water to the blender at first because I was using soaked cashews and I wasn’t sure how much liquid I’d need to add. I’m glad I didn’t because once I stopped blending and took a spoonful to taste, it immediately reminded me of chocolate pudding. Now, I’m someone who isn’t much of a pudding-fan, I’m always longing to pour it into an ice cream maker and churn it into a scoop of gelato. SO I did just that, and what came out was a D.R.E.A.M. – to make sweet potato purée: Prick a large sweet potato all over with a fork. Wrap in foil and bake in a 200 C (400 F) oven for 45-60 minutes until tender all the way through. Leave to cool then scoop out the flesh, discarding the skin. Blend the flesh until completely smooth. 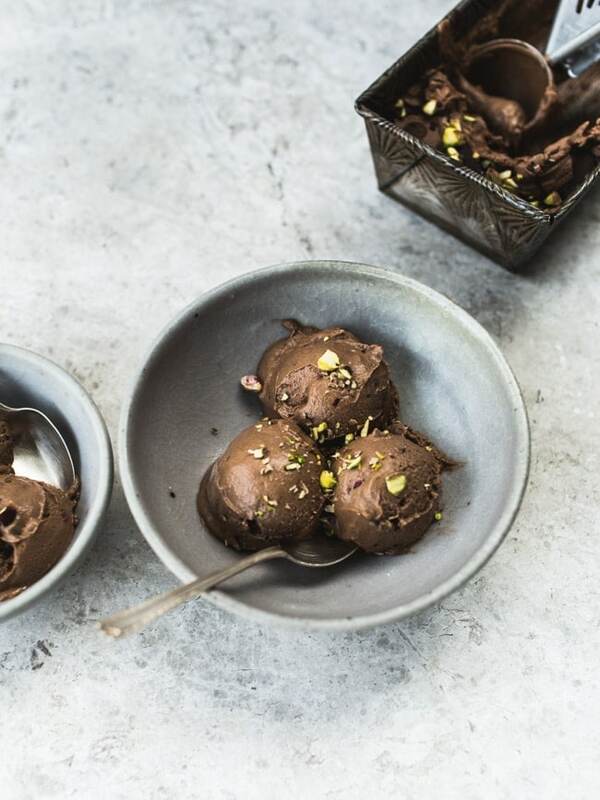 – In this recipe I’ve used raw cacao powder as I think it has a much more chocolatey flavour. If you can’t get any, normal cocoa powder will be fine but you may need to add more. – If you don’t have a high speed blender (such as a Boss or Vitamix), you’ll need to soak the cashews and dates in advance: Cover them with cold water and leave overnight then drain and use as usual in the recipe. Cover the cashews and dates with boiling water for 15 minutes. Drain, discarding the water, and transfer to a high-powered blender (see notes). Blend with around half of the cold water until completely smooth and creamy. Add in the rest of the water, the salt, vanilla, cacao and sweet potato purée and blend again until smooth. Churn the mixture in an ice cream maker until thickened and scoopable (this took about 40 minutes for my ice cream maker). Transfer to a loaf pan and smooth out then freeze for at least 4 hours until solid. If you want to decorate it: stir together the coconut oil and cacao powder. 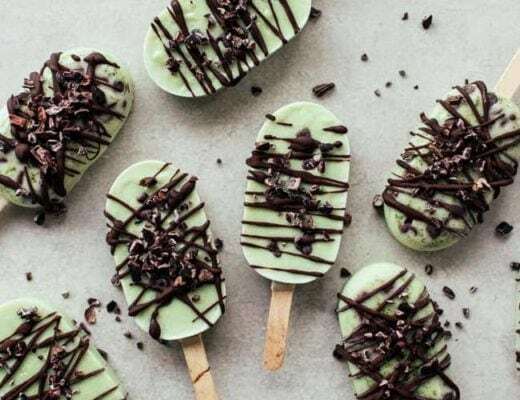 Drizzle it over the frozen ice cream and quickly scatter on the pistachios then return it to the freezer. what? smart! 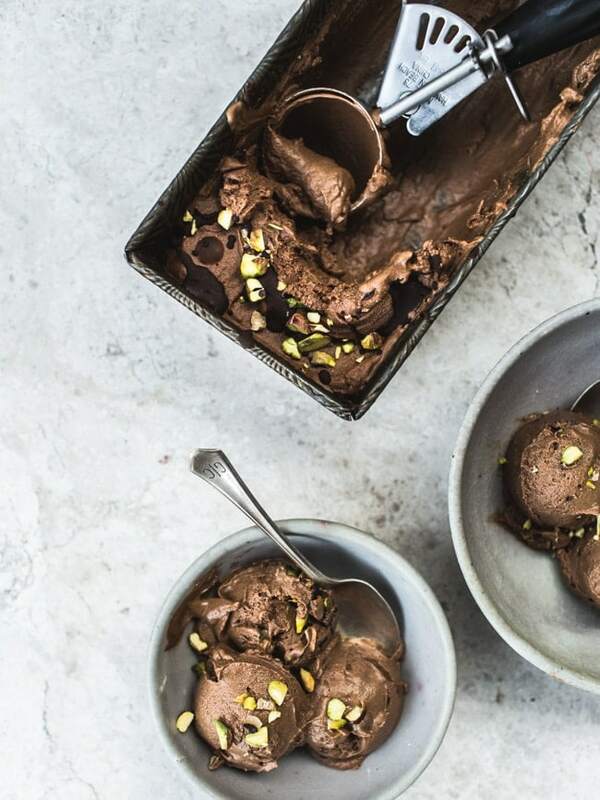 i just got an ice cream maker, so i’ve been on such a kick lately–so glad you shared this! i know what you mean about bananas, too. i can only do so many before i feel like i’m turning into one. 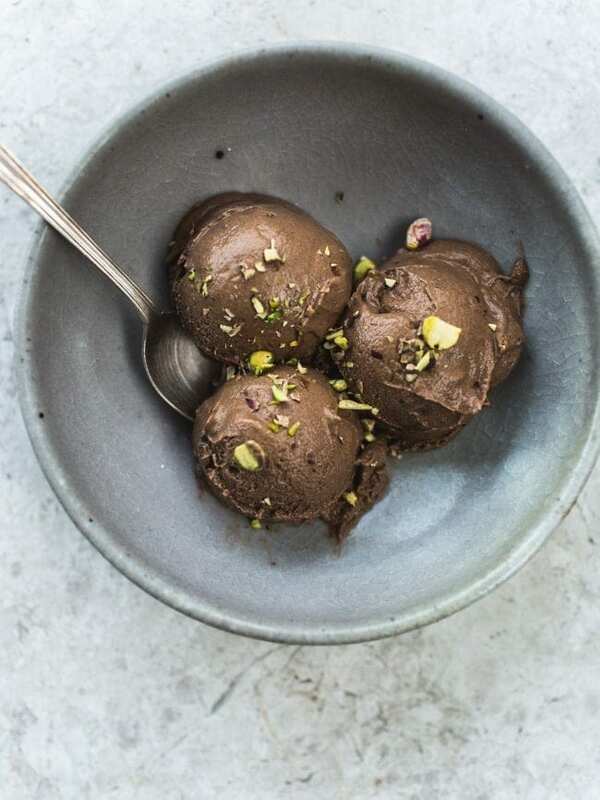 i bet this ice cream would be super good minus chocolate plus warming spices, too. Love it! I’ve used sweet potato to make a chocolate pudding and it’s amazing. But I love pudding. 🙂 Great recipe! Drool! Think I now need an ice-cream maker?! I made frozen banana ice cream once and that was enough! You can’t cover up banana flavor with chocolate. Excellent idea using sweet potato for a neutral base. I love this. 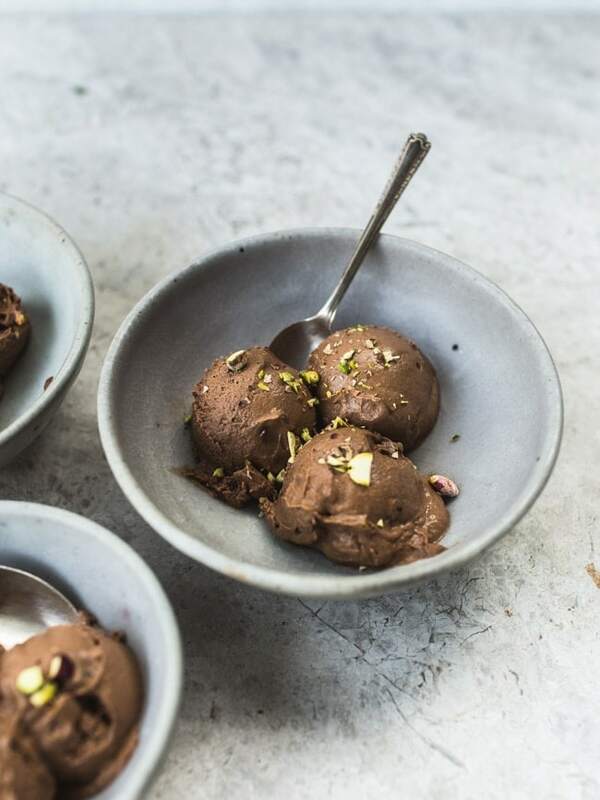 How awesome is that, a healthy chocolate ice cream. I never needed an excuse to eat chocolate ice cream, but now not only that, I have a reason why I have to eat it. Great! This sound (and look) fantastic! I’ve got to try it out! Yummy! Looks so creamy and chocolaty! I’m so happy you’re surviving! This is such a brilliant idea for using sweet potatoes! It looks and sounds so delicious! You are a freaking GENIUS! I can’t wait to try this you brilliant lady! 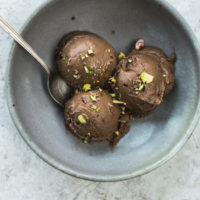 This ice cream looks amazing, I also love it because it is vegan and 100% natural, pinned. Sheer brilliance as always, girl–I bet the folks at uni are glad to have a gem like you sitting around 😀 good thing you have space for a pantry and all that jazz! Totally trying this ASAP! This is brilliant! What a smart idea and it sounds delicious! This is such a clever idea, sweet potato to the rescue! You’ve just combined two of my most favorite things in the world in one recipe: chocolate and sweet potatoes. <3 It looks incredibly creamy and luscious, I gotta try your recipe ASAP. I don’t see naturally sweetened ice creams all that often, and I love that this one is sweetened with dates and sweet potatoes! I use bananas a lot as a natural sweetened, but I agree, it’s flavor tends to be quite overpowering. Such a clever idea! Sweet Potato Ice Cream?! That’s a first! Such a clever recipe, Izy, I can’t wait to try it! 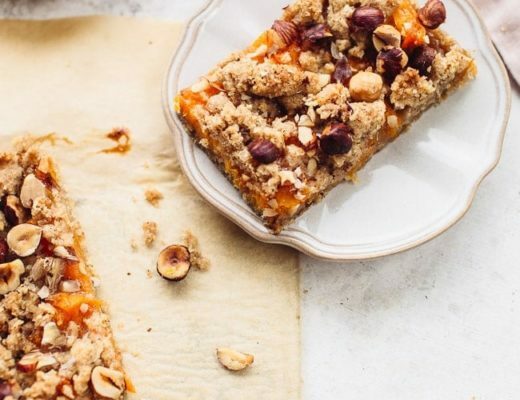 Adding sweet potato instead of banana or pumpkin is such a great idea! Look delicious! Tip: microwaving the sweet potato will also soften it up. I love sweet potato in desserts. 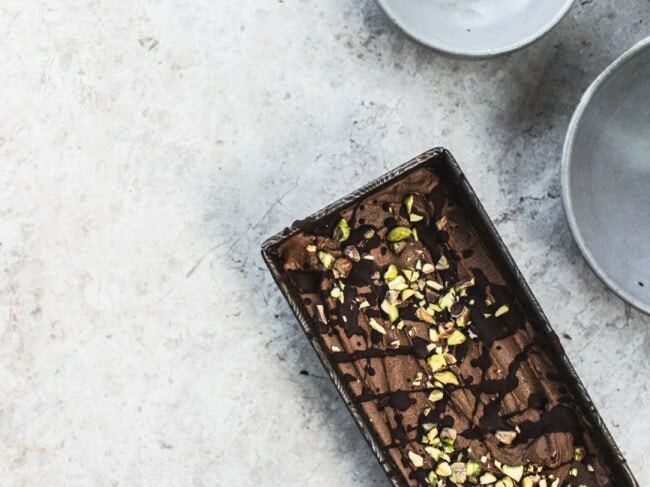 I use it a lot with chocolate (so this dessert is calling my name!) and I also oddly find it great with gingerbread flavours!! I LOVE this recipe, thank you haha! Could you sub cashew for something else?? Only nut that I can use is almonds ?? You just made my night!!!! Having to be dairy and gluten free can be a drag, so when I somehow found your post, I had to try this. Rock ON! To enhance the chocolate flavor, I added cinnamon. Next time, I’ll also add coffee (both enhance the chocolate’s flavor). This dish would be great with chopped sour cherries and cacao nibs. Oh wait – this is a great dip or custard to go with bananas…. or strawberries. Thank you for adding a little joy to my life. Keep pumping out those recipes! 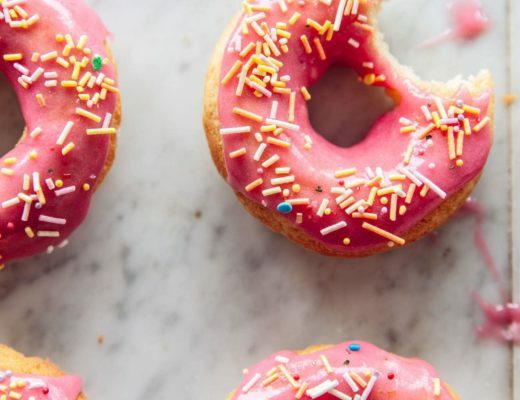 I think ‘magical’ is the only way to explain how the heck you came up with the idea for this recipe and how you created it (not to mention the photographs over which I am drooling at the moment). You surely are a magician, Izy. Otherwise I don’t know how to explain the existence of your creations, really. I feel completely not in the position to suggest you anything, yet I somehow can’t stop myself from sharing my latest discovery with you (you probably already heard about it or even used it, but still) – what I mean is erythritol. It’s almost 0 kcal, with no gastrointestinal problems involved and, most importantly, tasteless (unlike stevia). I highly recommend it for cooking, baking and anything that requires sweetening, really. This looks wonderful! I came over here from your Chocolate Hazelnut Crepes. I have been trying to find a crepe recipe that doesn’t involve eggs and I am hoping that yours hits the spot. And a Nutella-like filling? What’s not to like. However, the reason I came to this recipe is because I was hoping that you would show a picture of your sweet potatoes. Because, unfortunately, there’s sweet potatoes and then there’s sweet potatoes. So. Just to clarify, are you using the little white jobs that most grocery stores around here call sweet potatoes, or are you using the bigger orange items that most stores around here call yams, BUT are also called sweet potatoes?